For this problem it is easier to subtract 5x from both sides as the first step. add 17 to both sides. What inverse operation needs to be performed when given 21 = 7x? 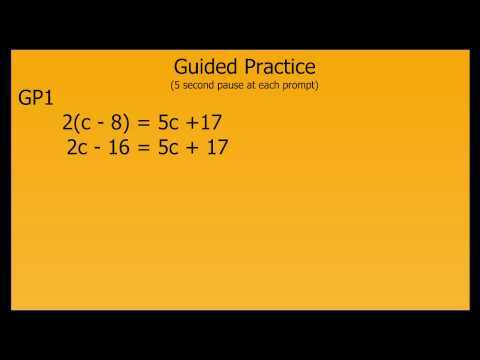 recognize that when 1/8 is distributed out, both 24 and 48 will be divided by 8. Will the narrator choose to move y to the left or to the right side of the equation? Right side of the equation. After substituting -6 for y, the narrator will follow the order of operations by simplifying the parentheses. The narrator is choosing not to apply the distributive property--which is acceptable. There is less chance of error when applying the fraction to one number. move c to the left or right side of the equation. Subtract 2c from both sides. Subtract 5c from both sides. Subtract 17 from both sides. What inverse operation is next? Multiply 3 on both sides. Divide 3 on both sides. After -11 has been substituted, will the narrator simplify the parentheses or distribute 2 across -11 and 8? He will simplify the parentheses. How do we simplify the right side of the equation? Apply the distributive property on the right side of the equation. Add 16w to both sides. Subtract 32 from both sides. Does this problem have no solution, one solution, or many solutions? 18 = 24 No solution. 18 = 18 Many solutions. 24 = 24 Many solutions.